True multitasking, AirDrop, Control Center, new Notification Center, iTunes Radio – all impressive new features in iOS 7. But perhaps none of those would win a public poll for Most Popular New iOS 7 Feature. You can now put Newsstand in a folder. Yup, you can send Newsstand into exile with prejudice; chuck it in a folder, call it whatever you like, and never have to lay eyes on it again. As with any built-in iOS app, you can’t delete Newstand – but at least now you can banish it to a folder, something that a whole lot of users have been wanting ever since Newsstand first appeared on iPad and iPhone home screens. Personally, I don’t mind Newsstand too much and have a few titles I subscribe to that make it worth having around – but I know that many of you have already sent it away or will soon after you read this. 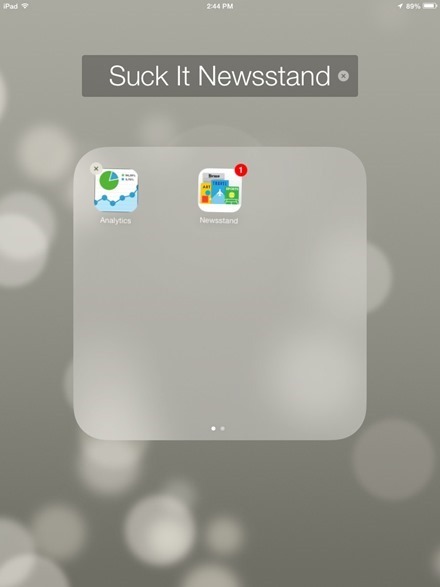 Have you banished Newsstand yet? Hahahaha! Thanks, I thought I was the only one who wanted to bludgeon Newsstand and iPad itself into oblivion. It becomes an obsession. It’s like wart on the skin of your tablet. Since updating I buried Newsstand with all my other least-favourite built-in apps in a folder marked “Useless”. It is truly one of iOS7’s best features.